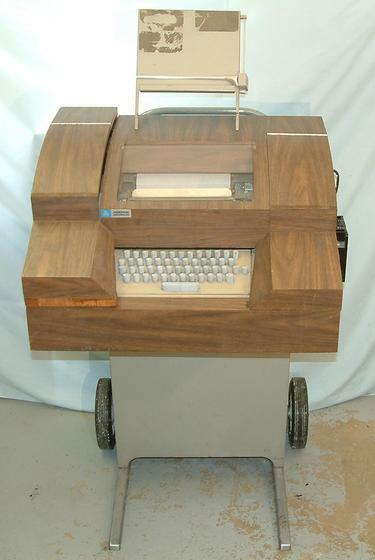 This is the front of a "portable" ASR 33 Teletype. The teletype is covered with a foam lined ( 31K) wood box to reduce the noise of the unit. It is also mounted on wheels to allow "easy" moving. The left side cover seems to have been modified to be higher by additions of the blocks of wood not covered in wood grain Formica. It is not clear why this was done. This is the only teletype I have seen with a sound cover. The cover label says Anderson Jacobson which manufactured modems. The teletype is missing the acoustic coupler and modem so I can't tell if they put their modem in a teletype and added the cover and wheels. Acoustic couplers were used with modems since it used to be illegal for a customer to hook any equipment directly to the phone wire.